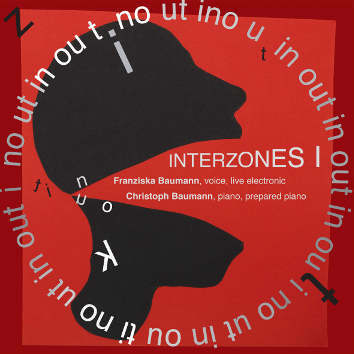 The musical inventions of Franziska Baumann (singer, soundartist/composer, a pioneer in "new vocalities" and gestural live electronics) and Christoph Baumann (piano, prepared piano). breathe with spectacular soundscapes and songlike sequences, rhythm pulses, rough sound eruptions and chambermusic sequences, strong melody clips and unorthodox sounds. Driven by this high energetic mixture INTERZONES represents not only a meeting between two musicians who have explored voice and piano as multi-faceted instruments expanding traditional boundaries, it is also interlinks zones between contemporary music, performance and current forms of improvisation.